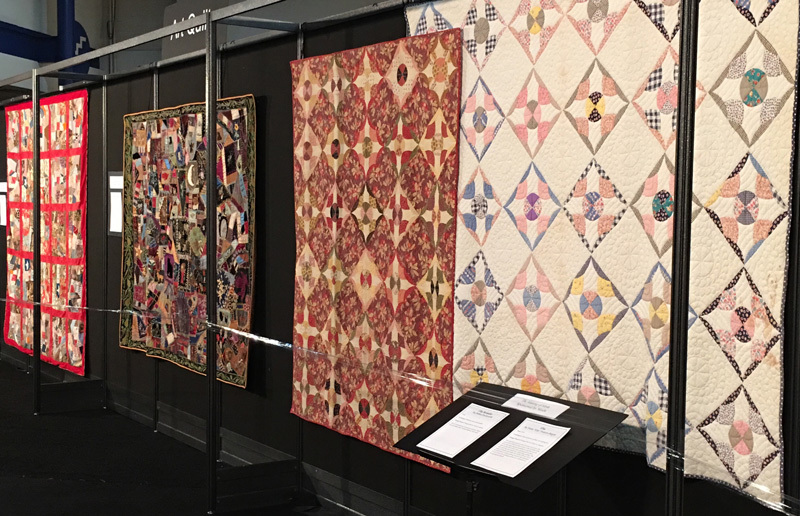 In the Fall, International Quilt Market is always followed by International Quilt Festival. 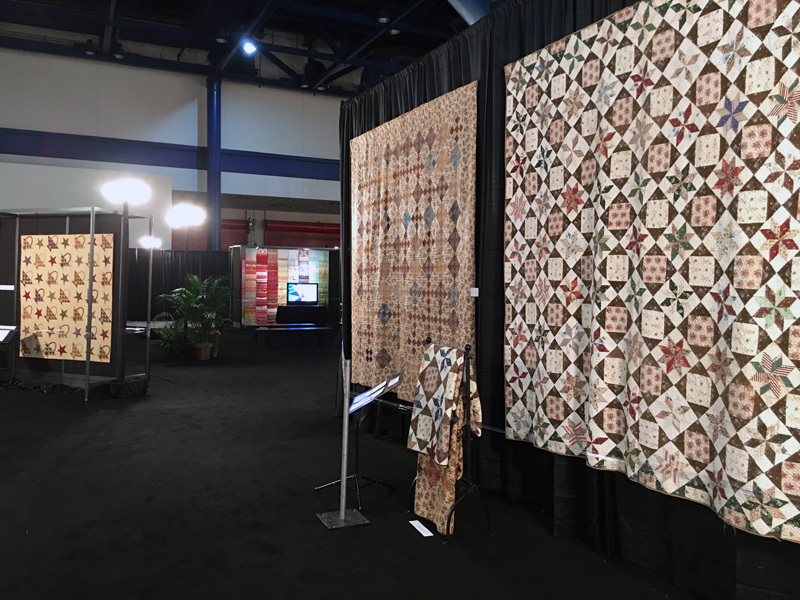 If you’re not familiar with it, it’s a huge quilt show featuring hundreds of spectacular quilts from all over the world, special exhibits and a very, very large vendor hall that will surely challenge your spending willpower. This was early in the evening on Wednesday – Festival Preview Night. Koala Studios Master Award for Innovative Artistry – White Holes by Peter Hayward. Robert S. Cohan Master Award for Traditional Artistry – My Sweet House with Kirara by Ayako Kawakami. This quilt was made for Ayako’s 10-year old daughter, it’s the 5th quilt she’s made for her. This quilt is made with hand-applique, hand-embroidery, and hand-quilting. 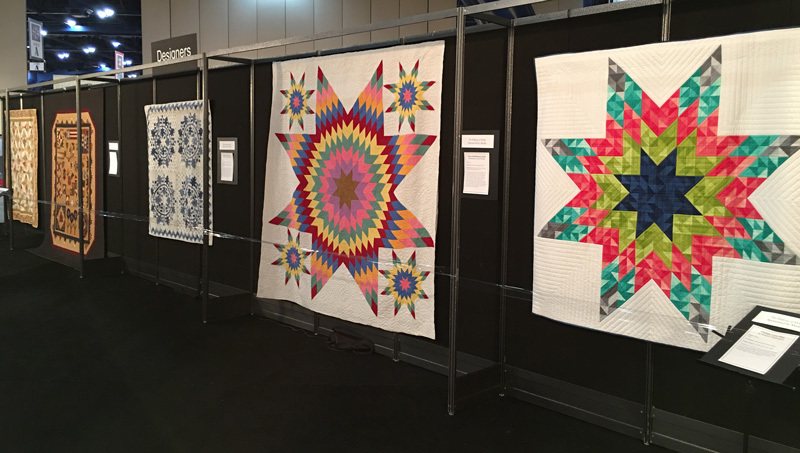 Handi-Quilter Best of Show Award – Ewe Are My Sunshine by Janet Stone. This quilt features machine-piecing, raw-edge applique, embellishments, free-motion embroidery and machine quilting. The Founder’s Award – Brilliant Rose by Junko Fujiwara. This quilt is made with hand-applique, hand-embroidery, and hand-quilting. 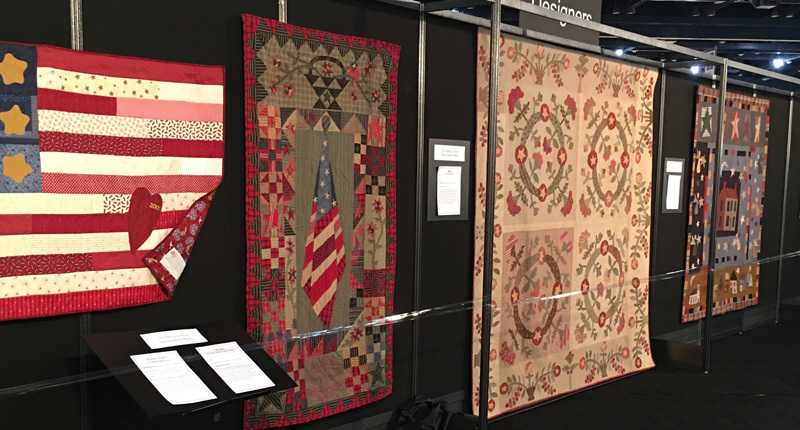 To see more of the winners at Quilts: A World of Beauty, the 2015 annual Judges Show of the International Quilt Association. 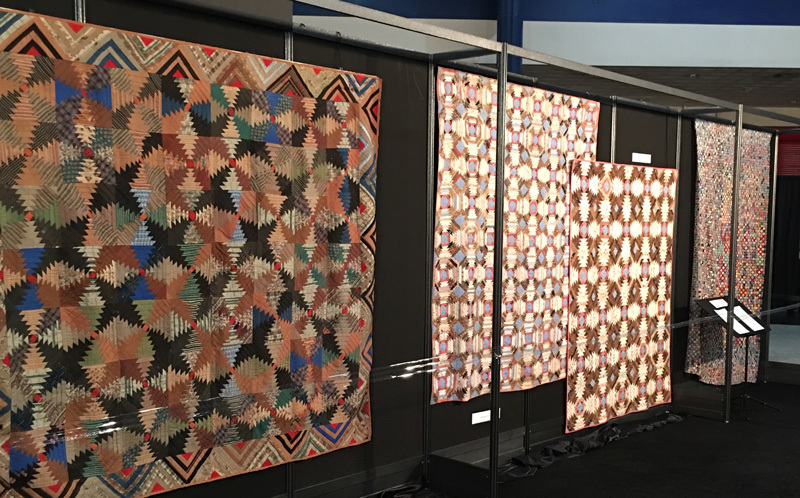 For folks here, the best part of Quilt Festival was the special exhibit honoring Mr. Dunn, United Notions’ 40th Anniversary and the Making of Moda. The exhibit was designed and curated primarily by Josh Dunn with help from Lissa Alexander, Debbi Duckworth, Holly Hickman, Joy Ansell, Erin Michael Dunn and what I’m sure is a very long list of people I’ve forgotten. 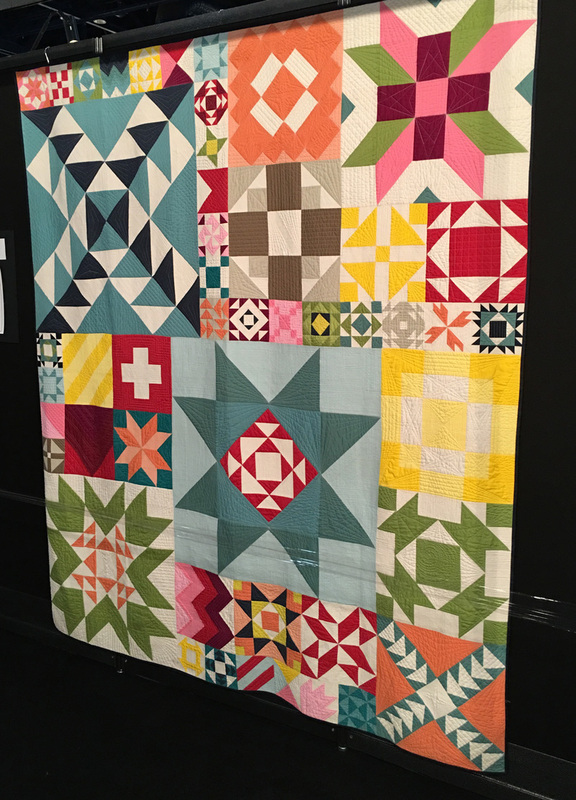 Some quilts were so recognizable as Moda-made that an exhibit of the Making of Moda had to include them. 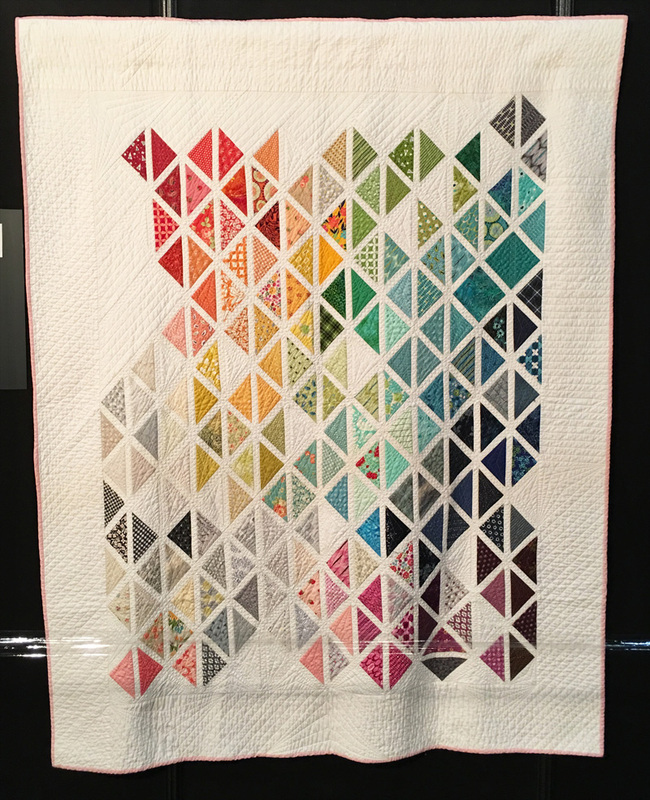 Modern Building Blocks by Holly Hickman and Lissa Alexander, quilted by Natalia Bonner. Piece No. 12 by Lissa Alexander, quilted by Maggi Honeyman – this might be the only quilt ever that got its start as an idea for a catalog cover. As cool as that catalog cover is, this quilt is so much better. There were some of Mr. Dunn’s art quilts. Any Woman… Every Woman by Deborah Langsam. The image on the quilt is adapted from a photograph by Arindam Bhattacharya and was designed to bring awareness to the problem of domestic violence. 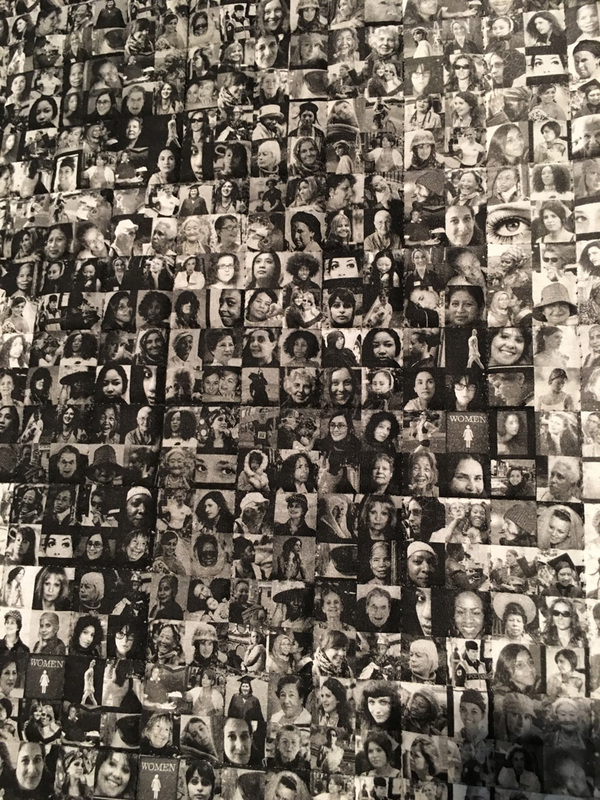 It is a mosaic of thousands of one-inch square images of happy, upbeat women. Deborah also designed Shoe Envy. 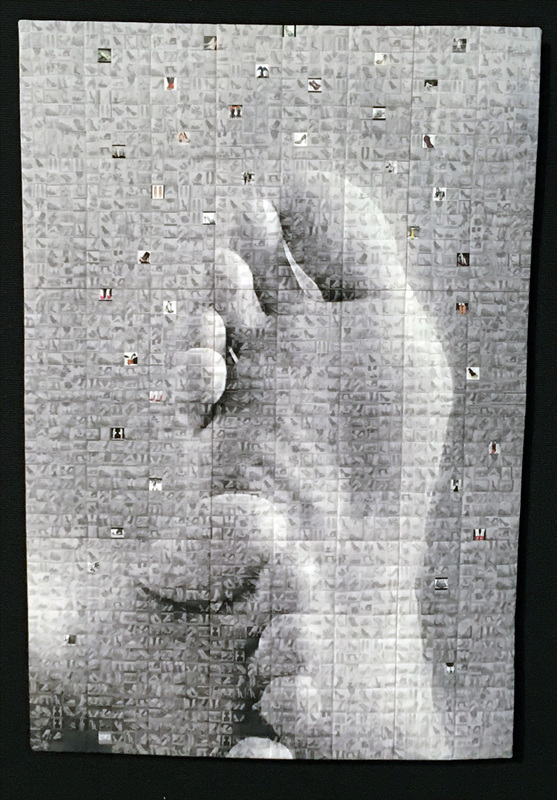 For this quilt, the tiny squares are pictures of shoes. This is a close-up of Broodstairs/Kent by Inge Hueber. It is hand-pieced and quilted, and it’s made with hand-dyed fabrics. 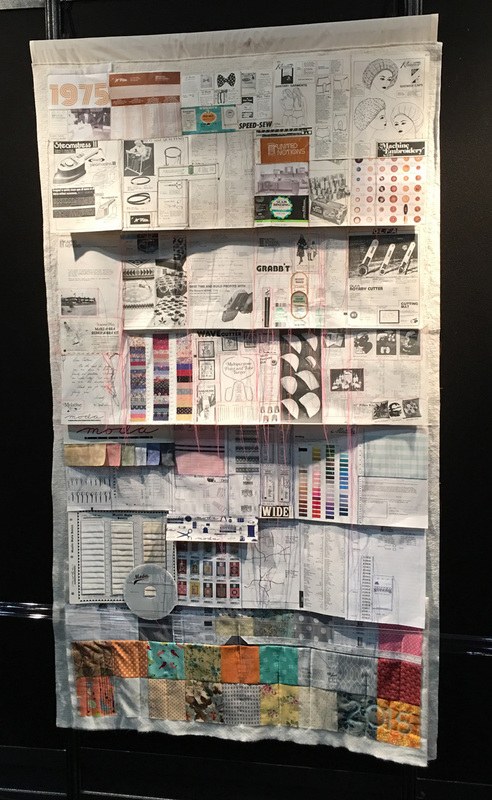 The exhibit included a wonderful collage made by Erin Michael Dunn depicting the history of a sewing notions company that gave birth to a fabric company – United Notions to Moda Fabrics. 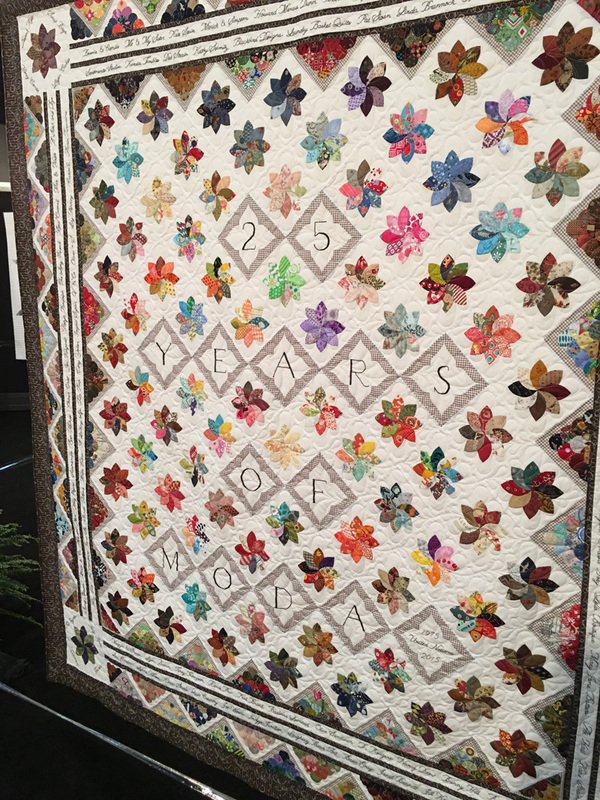 There was also a spectacular quilt made using a fabric designed specifically for the anniversary – it’s called Celebrating 40 Years. 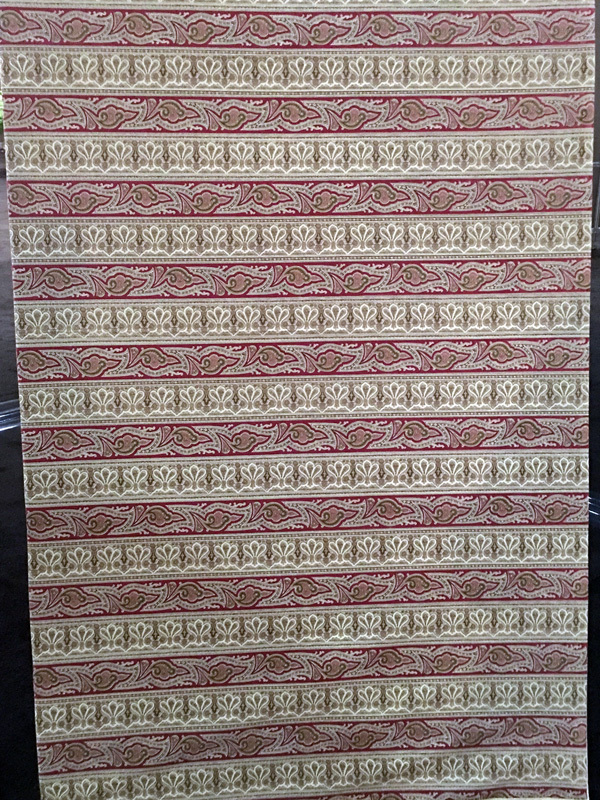 It’s a selvage print listing the first collection of the talented people still designing fabric for Moda. The name of their first collection and the year it was produced is listed. 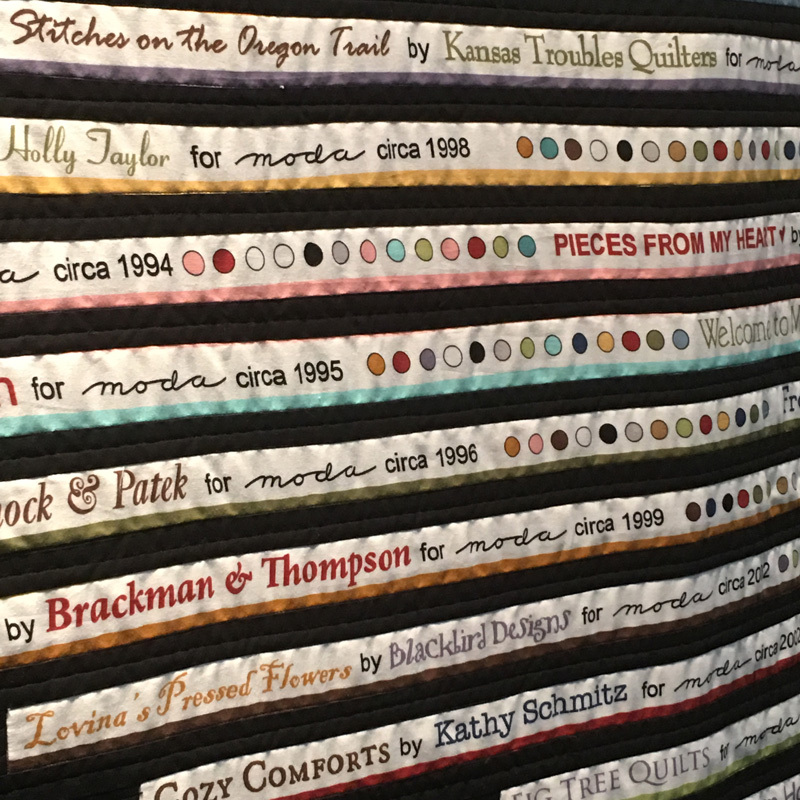 Josh Dunn designed – and made – a quilt showing the timeline of when designers joined Moda – the Moda Designer Timeline quilt. 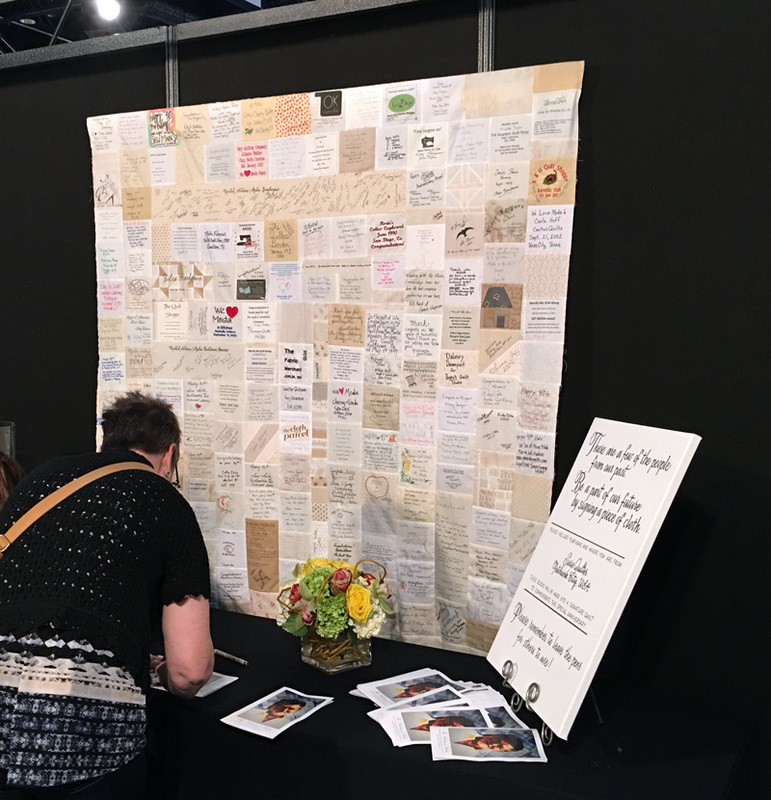 There was an “in the works” signature quilt – and everyone was encouraged to sign a block to be included in what might turn out to be a Texas-sized quilt. The four sisters – Andee Andriole, Cheryl Anne Edholm, Candee Ferris and Mary Andra Holmes – of Sister’s Quilting Trunk gifted Mr. Dunn with a hand-appliqued, hand-embroidered, machine-quilted quilt that took 2779 hours to make. 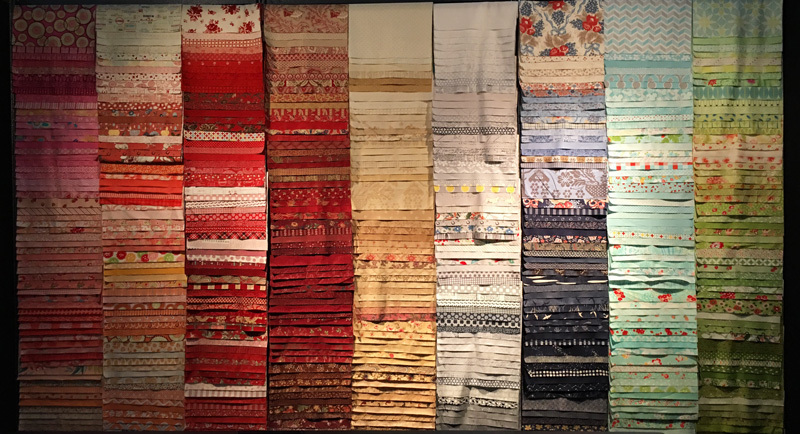 The names of every Moda fabric designer is embroidered in the borders, and 1085 different Moda collections are represented in the fabrics. The name of every Moda collection is machine-embroidered on the backing of the quilt. 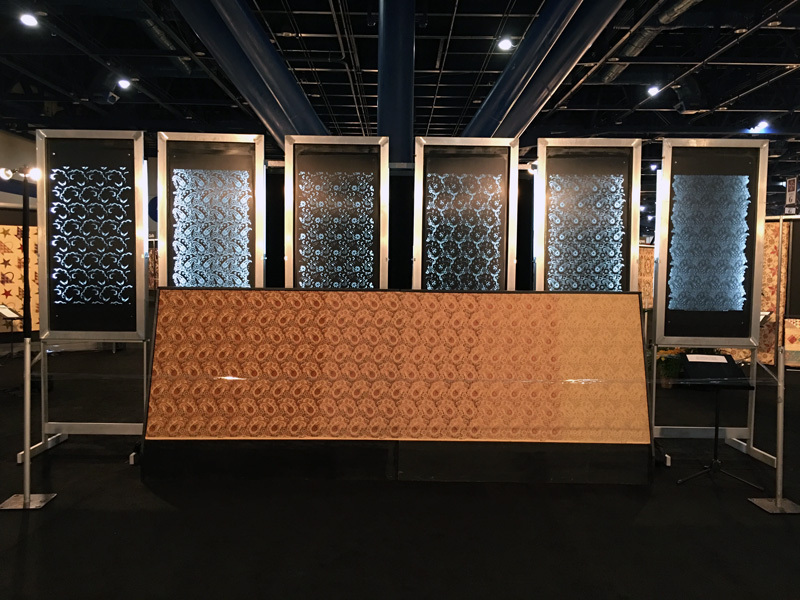 How Moda Fabrics are produced was included in the exhibit – these are six flat screens used to print the single piece of paisley fabric shown in the foreground. A print like this one requires a little bit more detail in the printing process. So rotary screens are used instead. There was also a short video showing the process of printing Moda fabric. Yes, we’ll see what we can do about making the video available to everyone. 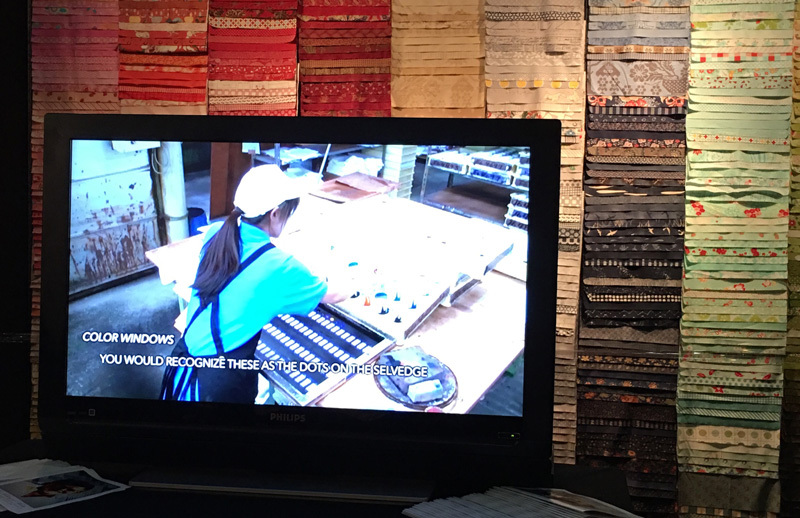 Behind the television was one of my favorite parts of the exhibit, a color-wall of Moda Fabrics. 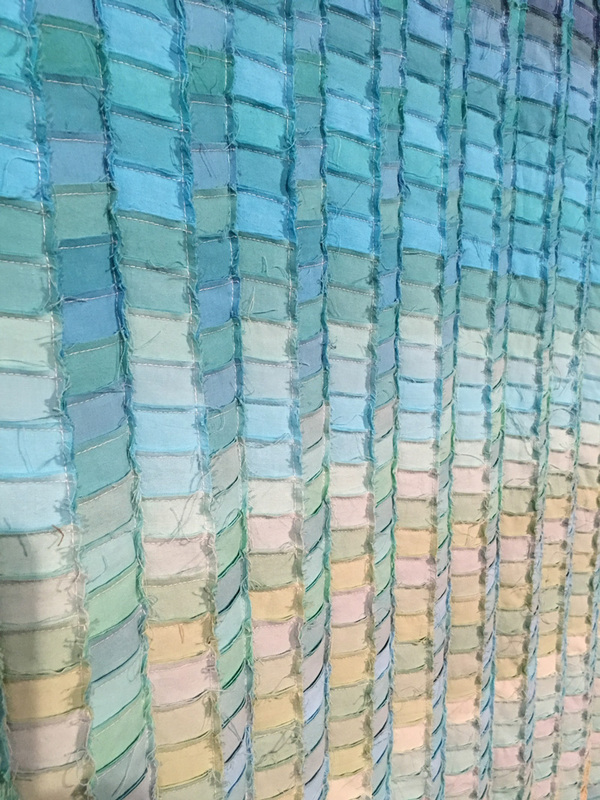 It was unanimous – we all wanted to take the wall home with us… and cut it up to make something Modalicious. There is one more Market-related post to come – a wrap-up of sorts. Once that’s done, we can start chatting about all of the pretty new fabric that’s coming, some of the new patterns I saw – and loved, the new books I’m already coveting, some new toys tools, and thread! No matter what you might have heard, I wasn’t just wandering around taking pictures. Mighty fine post! Thank you! Fabulous recap. Love your new word Modalicious. Thank you Carrie. Super cool recap. Thanks for all of the pictures! Oh my gosh. 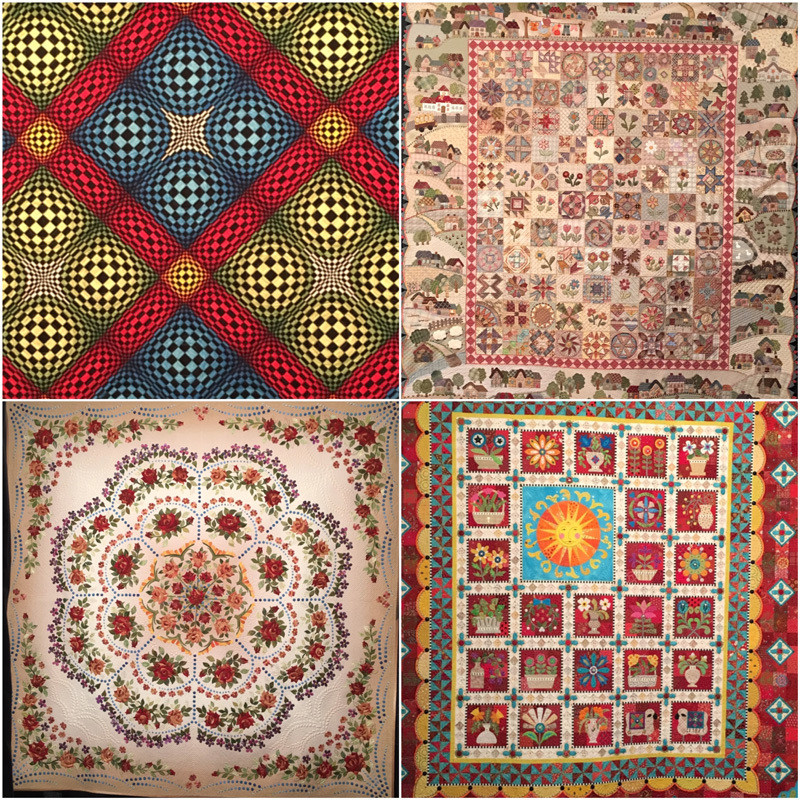 There are no words to describe these pictures of so many magnificent quilts. Just a WOW event. Thanks for the view. Loved seeing the different ways fabric is made! Thanks!! Thanks for this post and the photos! Thank you for this very interesting post and pictures!! Thanks for sharing so many wonderful photos! 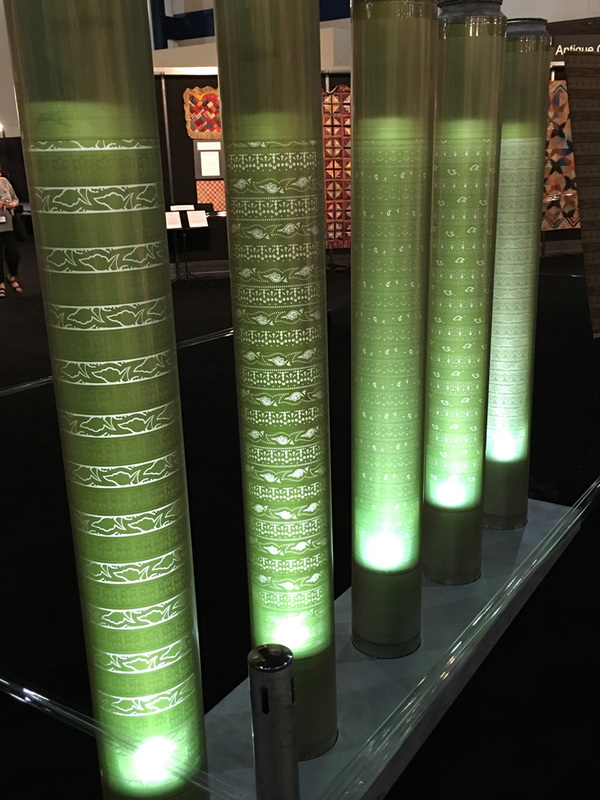 I hope the video of printing Moda fabric does become available to all of us. It would be so interesting to see the process. This must’ve been something to see! A wonderful landmark for Mr Dunn,United Notions and Moda, and all of us who love ’em! wow….moda eye candy for sure! thank you for all the pictures!! All I can say is, it is amazing to see the talent and imagination in the form of fabric. I look forward to seeing the video. Thank you so much for your post. 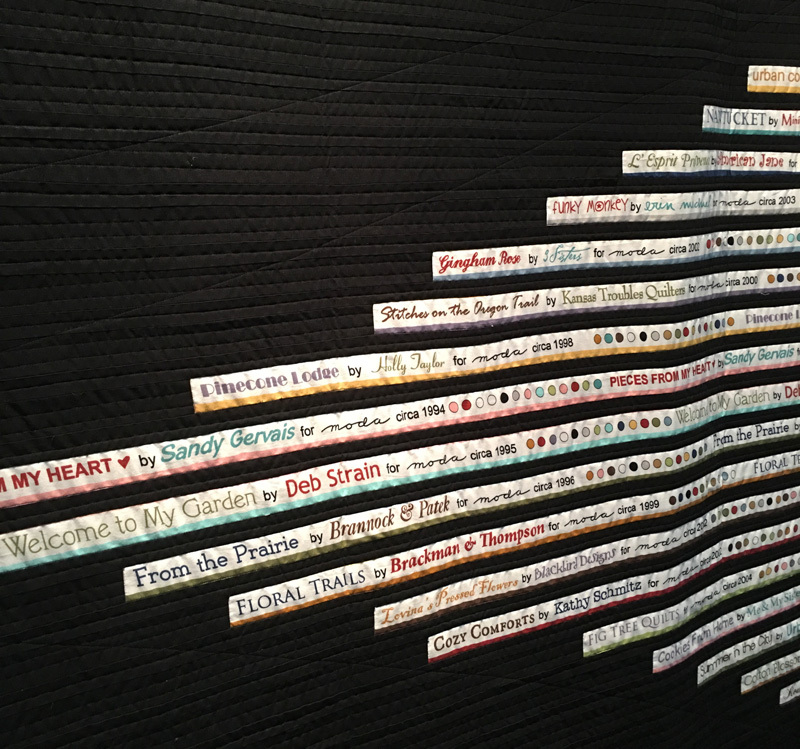 What a great exhibit, from amazing quilts to the printing process. Enjoyed your post, Carrie … and wow, Modalicious indeed !! I didn’t get to go to Festival this year, due to a family illness, but it’s only the 2nd time in 28 years that I haven’t been. Can’t complain, I’m very lucky because it’s nearly in my backyard ! So much talent and inspiration in one place, it never fails to amaze me and anyone new that I take ! 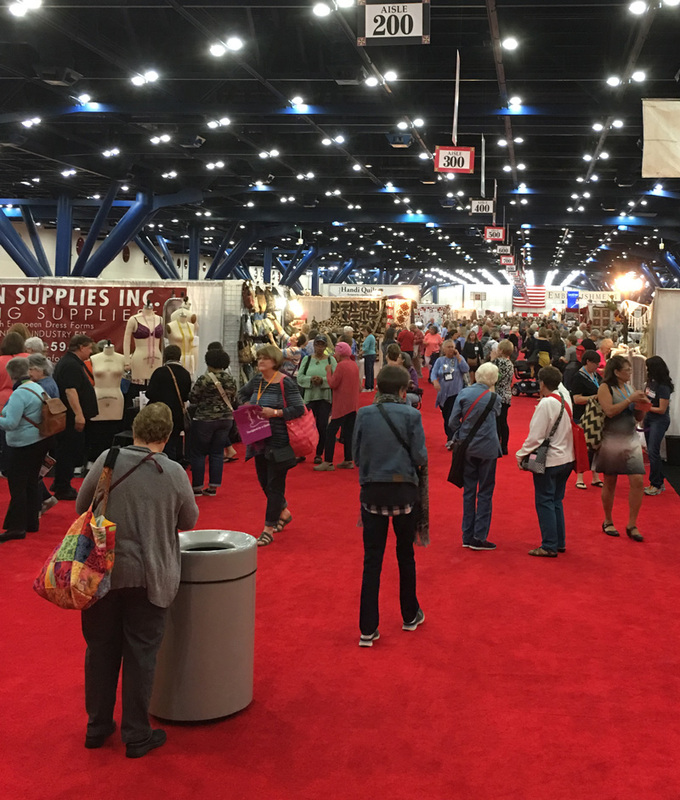 I love to see newbies’ reactions to Houston’s Quilters’ Mecca !